According to the BBB, one of the top most-read articles among accredited retail businesses in 2017 was “The Single Reason Your Retail Business Could Fail.” The single reason? Distrust in the workplace. The article described how important trust is for a company to be successful. Not surprisingly, high-trust companies outperform low-trust companies by nearly 300 percent. Also, a lack of trust among employees’ leads to high turnover rates, absenteeism, theft, fraud, and workplace conflict. It’s crystal clear a lack of trust can cripple or destroy a business. I was a little dismayed that trust was an issue that apparently goes unnoticed or unaddressed on such a large scale. At Tracy Zeller Jewelry, home of the Great One Divine® jewelry collection, the environment of team and trust is a high priority. It seemed sad that so many companies – and their many employees – were spending their time at work distracted by the anxiety and negativity that festers in a distrustful environment. The article shared questions to gauge the level of trust in a workplace. It also spoke clearly to CEOs and senior management…trust starts at the top. And two ways every leader was asked to demonstrate trust were with traits we should all strive to display: character and competence. It even outlined a few steps to help build trust in a workplace. While I read the article, I softly began to hum the old hymn, “Trust and Obey.” It popped into my mind as I read about trust, confidence, understanding, forgiveness, and purpose. If we trust in our employer, it’s easy for us to obey the guidelines and procedures they set for us. We trust that when we are obedient to policy and we do our best work, they will reward us with a positive and healthy workplace. The same is true for Christians. When we trust and obey in Jesus, we are assured we will be blessed. We are promised to know the joy he bestows and the delights of his love. Not a doubt or a fear, not a sigh or a tear, Can abide while we trust and obey. Never underestimate trust. Once lost, it can be impossible to restore. When trust is solid, it provides for a happier life in both work and at home. Trust and obey, for there’s no other way… To be happy in Jesus, but to trust and obey. 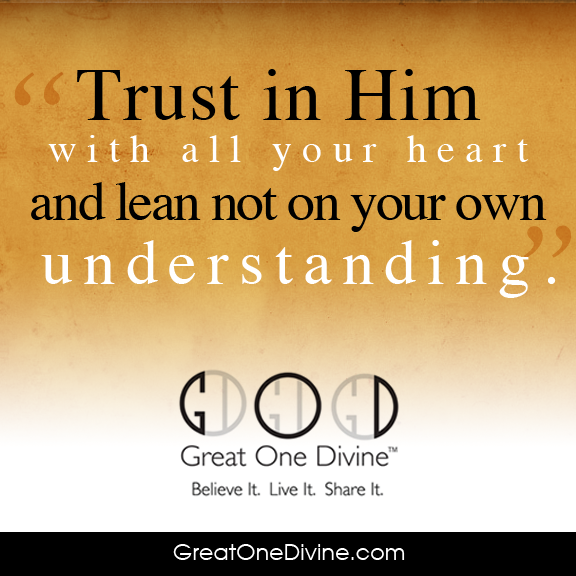 Keep up to date with the latest Great One Divine® news! Find out about new products, special offers, and hear inspiring customer stories. It's easy to sign up - just fill in your name and email below.